Reception Only Invitations for your post-wedding reception. Each invitation is custom printed for one the biggest days in a couple's life. 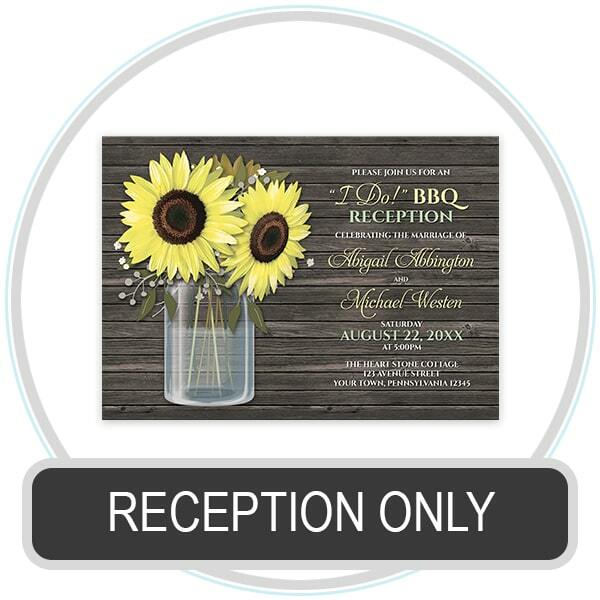 Popular designs include beach reception only invitations, sunflower "I Do! BBQ" reception only invitations, deer reception only invitations, seasonal invites for Autumn/Fall, Winter, Spring, and Summer, and more. Use these invitations when you're getting married in a private ceremony, having a destination wedding, or have eloped, and are only inviting your guests to your post wedding reception celebration. Every couple's situation is different. This means the wording you need may be different from the pictured examples, and that's okay! Provide the wording that fits your situation and occasion. You can tell your guests you were married in a private ceremony and you want to celebrate with them at the reception. Having a destination wedding? Share the excitement of where and when you are getting married, and invite them to your wedding reception. You will go through a complimentary proofing process with the Designer. After you order you will be emailed a proof image of your invitations for your review and approval so we can get everything just right.